Dressing up for Halloween is essential, whether you’re a terrifying ghoul or wicked witch. 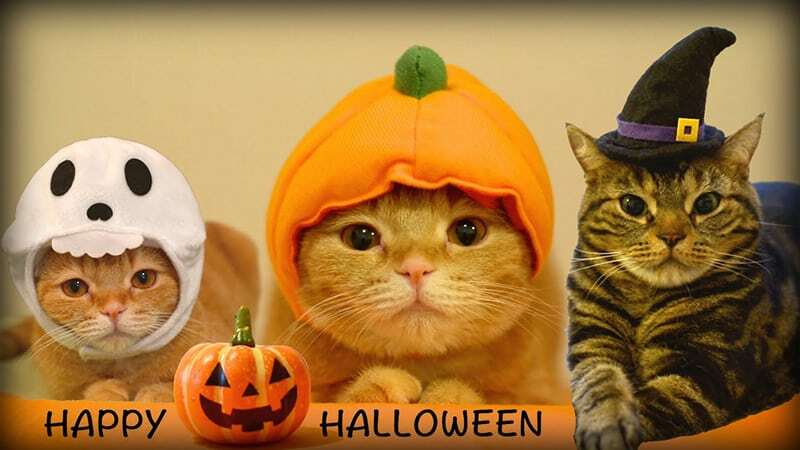 Your cat is the perfect Halloween accessory and fortunately for you, there are plenty of options to choose from. Despite being a revered companion to humans in ancient Egypt and Rome, during the Middle Ages cats became demonized in Europe. They were associated with witches and the devil and people began to fear their presence. Superstitions about cats became so prevalent that people began killing them in an effort to ward off evil. In fact, the culling of cats was so extreme that some scholars think it helped to spread the Great Plague, which was carried by rats. Nowadays the level of superstition around cats has largely dissipated, and at worst they are seen as an omen of bad luck rather than the devil’s vessel. 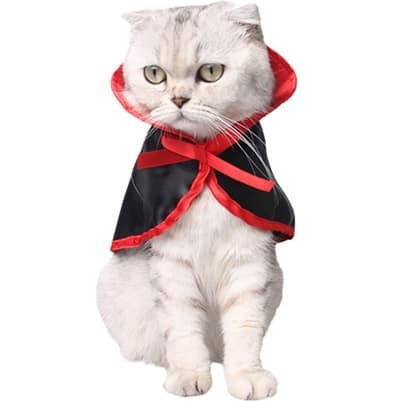 However, the associations of cats with Halloween has remained, making this the perfect holiday to dress up your cat. Your cat may take a bit of getting used to its costume and its best not to try and force them into it. You’ll end up with a lot of bites, scratches and a very grumpy cat if you do! Cats don’t like unfamiliarity and the sight of a flapping new cape or a costume with lots of extra arms or tails is likely to scare them. Their highly attuned sense of smell makes them very sensitive to the smell of a new costume, particularly if it is totally enveloping them. Costumes which make noise are also likely to unnerve your cat; rustling fabric, bells or sound-effects can be positively terrifying to sensitive cat ears. 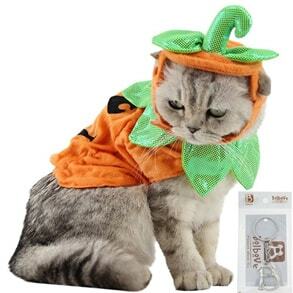 A costume which limits their movement will surely irritate your cat and may even cause them distress. Cats like to know they can escape and are used to moving about freely, so costumes which restrict this will unsettle them. The easiest way to get your cat into costume is a little purr-suasion. Allow your cat to familiarize themself with the costume by leaving it around the house about a week before Halloween. They can investigate it and through playing with the costume, it will begin to smell like them. After a few days, place the costume over their back for ten seconds, whilst playing an interactive game with them or giving them a treat. When the big night comes, gently put the costume onto your cat, reward them with treats and play with them to allow them to feel safe and comfortable in it. Then take lots of pictures! Shiver me whiskers, we’ve heard of an old seadog but never a seacat. 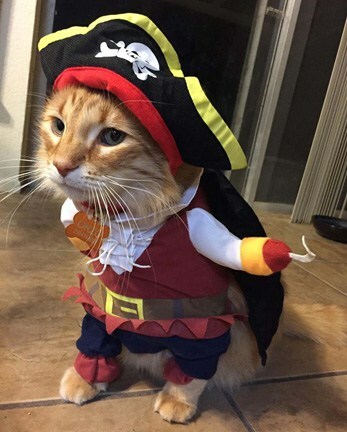 Transform your cat into a puss in pirate boots with this hilarious costume. It fits onto their front paws, making it seem as though they are walking on two legs, and is completed with a pirate’s hat and hook hand. Available in 3 different sizes. 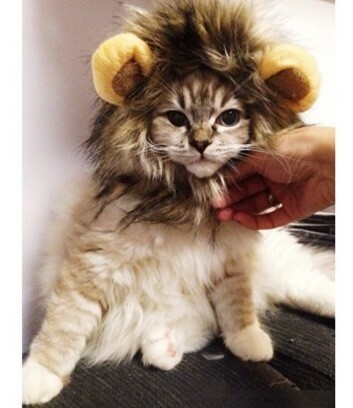 King of the jungle (and your heart), your cat will probably look more adorable than terrifying in this Lion Mane Wig. It’s easy to slip on and off your cat, so shouldn’t cause you too many problems on the night. Suddenly all that biting makes sense because it turns out your cat is actually…. a vampire! This spooky cape with blood red trim will help give your guests fair warning about what is in store for them. The adjustable tie means it will fit almost all cats and you can loosen or tighten for a comfortable fit. Who needs to spend all that time scooping out and carving a pumpkin, when you have your own little furry pumpkin? Dress your cat up in this super cute costume and entertain your guests. Available as a hat, tunic, or combination of the two, this costume is fully adjustable making it comfortable for your cat. 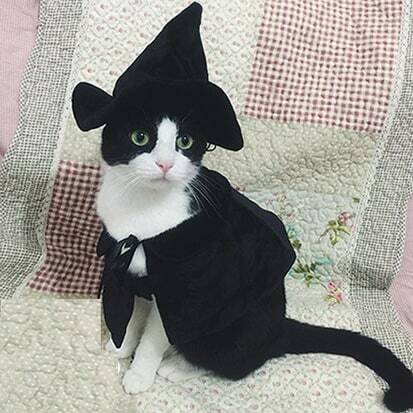 It’s a well-established fact that cats are actually witches’ assistants (see above), so let your feline helper show their true colors this Halloween. The costume is fully adjustable to fit your cat and comes in two different sizes. Spook your friends and neighbours with these terrifying (albeit rather cute) costumes for your cat this Halloween. Be sure to take lots of pictures and reward your cat with treats!